1. Spot two year old headed straight for the path of a snake at Melbourne’s Royal Botanic Gardens and sprint to save surefire Death Adder catastrophe. 2. 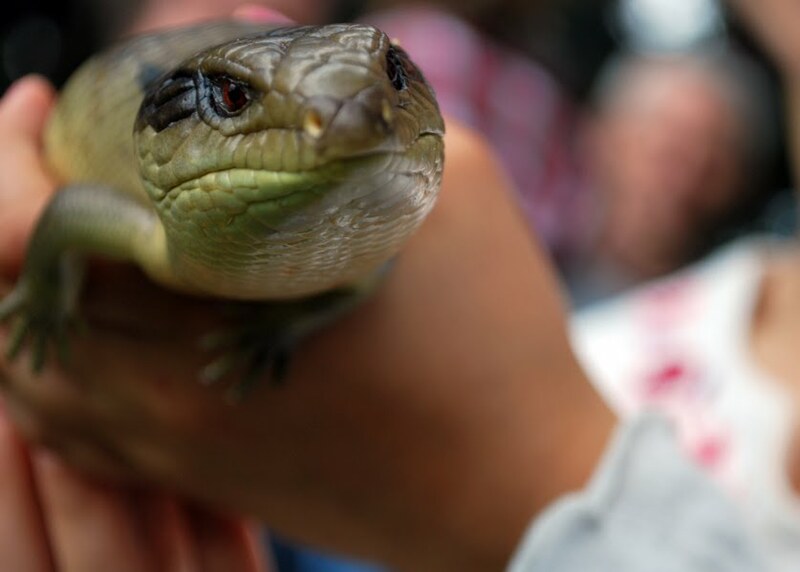 Realise Death Adder in question sports four legs and is blowing reptilian raspberries with a blue-stained tongue. 3. Pick up Not Death Adder But Blue Tongue Lizard and present to anklebiters. 4. Bask in infinite anklebiter street cred glory. 5. 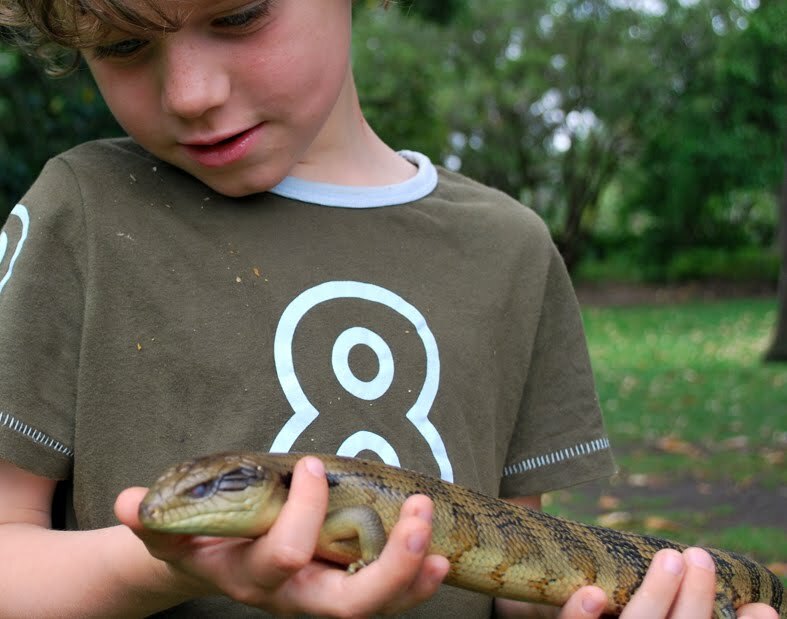 Name the Not Death Adder But Blue Tongue Lizard ‘Lemon’. 6. Declare after lizardy/kid bonding that it’s time to put Lemon back from whence he came. 7. Watch infinite anklebiter street cred glory fly out nearest window regardless of the fact that Lemon is less likely to be served a roasted beetle dinner with the works at our house on Sundays. Eldest partly consoles self by collecting two leaves upon which Lemon walked. That's funny - you have me doing a fitful belly chuckle with that one - particularly the image of your child picking up leaves as a momento of said occasion. Loving the melodrama of it all. Aw, the ankle biters should give you extra credits for touching and handling said reptile, even if it wasn't a snake. There wouldn't be any street cred with most mums shrieking "ahhhh! Lizard! Run!" so you can hold your head up high! Yep, I'm impressed that you picked it up at all. I think being unpopular for not allowing them to keep it is an excellent precedent to set - your house would be full of all sorts and conditions of manner of beasties. Shudder. How about a t-shirt - "Best Mum" on one sleeve and "Worst Mum" on the other. 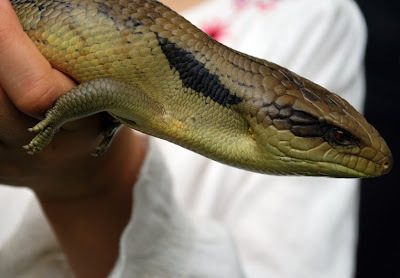 I think I have more of a fear of blue tongue lizards than snakes (a hangover from childhood and the tales told of the lizard who lived under a rock in our front yard). If only I'd known a spot of therapy would've been available with Team M&E. Lemon looks almost approachable. Still laughing about the leaves... your children are so earnest! Karin's right . You're definitely vet cool . Being blasè about reptiles is impressive , even cuddly ones like Lemon ..... especially cuddly ones , in fact . Wonderful stuff. I bet the lizard is grateful you're not always the best mum in the world. If it makes you feel any better we were the worst parents in the world because after an hour of hunting and finding crabs at the beach decided it was enough and time to go home.... you probably herd the screaming. I agree with Kylie massive mum points to you for picking it up!! Hey you get The-Best-Mum-Ever title hands down for picking Lemon up. Aww...little ones do get so very attached to every critter that is happened upon. lol in my family I would have been the one wanting to take him home, not the other way around! I own four lizards as it is, and I don't think my bluetongue Buffy would be very happy if I brought home more competition! He's just gorgeuos though, I love his "lemon" colour. You can always tell them they have to wait until they're 10. That's the age you can aquire a reptile license. They make fantastic pets, and live or a good 15 years! I can't believe you picked it up! I definitely wouldn't pick one up! You are one brave mum. I'll give you a gold star. You're top of the pops in my book. What a beautiful moment in 'nature'. I have no problem with spiders. Snakes are fine. But Blue Tongues. . . aughyuk. Too many aweful childhood memories of them standing between me and the outside toilet.
. . . and tales of them latching on and not letting go! ooo, magnificent beast... I would not have been so brave. Very cute. Your heart must have been beating so fast when you thought it was a snake! In our little country with no dangerous animals it is so easy to be a vet cool mum, picking up a frog or spider here makes me a cool mum already In the eyes of many other mums). but in your country: no way I would dare to pick up an animal. in my opinion they are all deathly dangerous and may kill you with one bite in one second. Blue tongue.....brrrrrr the word itself makes me shiver! Well done for being brave and picking up Lemon. I wish my kids would be so proud when I go on a worm mercy dash when it rains. I can't leave them to drown in puddles. It's my duty to save them. Great pictures Tania, I have never come across one of them yet...but I hope I don't really:)Brave lady you are!! Oh hero to zero this parenting job - how about a lvoely bargain guinea pig to settle the seperation anxiety - ha ha. Clearly this Mum of three, wife of one has handled reptiles before. Let me tell you folks, I was still recovering from the shock of possibly seeing my first up close and personal experience with dangerous Australian wild life when all of I sudden I realise it's in those wonderfully skilled hands. From Blue Tongue to Lemon ... isn't it true we are put on this planet for the journey and not the destination!!! I was there at the time. Why do I not rate a mention in this anecdote?